Check out the latest news on multilingualism in urban spaces on the LUCIDE website www.urbanlanguages.eu and sign up to the ebulletin or get involved in our workshops and seminars. The subject content and assessment objectives for new GCSEs in Modern Foreign Languages and Ancient Languages were published on 11th June. These are the criteria that Ofqual will use to regulate and which the awarding organisations will use to create exam specifications. So they are the proposed basis for the specification that schools will finally receive. Content for Languages GCSEs is being issued now, while the timetable for first teaching remains September 2016, with first examining in 2018. The Government wishes young people to have access to qualifications which match and exceed those of the highest performing jurisdictions and the Department is now seeking views on the proposed subject content and assessment objectives for these new GCSEs. Proposed subject content for reformed GCSEs in English language, English literature, mathematics, biology, chemistry, physics, combined science (double award), history, geography, modern languages and ancient languages, as well as the Reformed GCSE Subject Content Consultation document are available here on the Department’s website. The consultation will run from 11 June until 22 August. In parallel with this consultation Ofqual are consulting on the revised regulatory requirements for the reformed GCSEs. The Ofqual consultation will be available here. With the arrival of talking pictures in the late 1920s, film industries in Europe and America faced a new dilemma. Silent films had spread easily round the world, needing only the simple exchange of one title card for another in a different language to be fitted for foreign export. But how could companies hold onto their foreign markets once characters in their films started talking? Primitive soundtrack dubbing was tried, also subtitling, but the method that took hold, if briefly, was multi-lingual production, with the same film issued in different language versions. Britain set the ball rolling in the summer of 1929 with Atlantic, made in English and German. Greta Garbo in Hollywood made her talkie debut in English and German versions of Anna Christie. Marlene Dietrich, in The Blue Angel, did the same at Ufa’s Neubabelsberg studio outside Berlin. Neubabelsberg was the world’s bastion of multi-lingual production in the early 1930s, with troops of actors, German, English and French, following each other onto the same sets in numerous musical comedies and dramas, including the popular Congress Dances and the futuristic spectacle F.P.1. 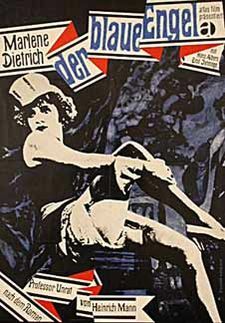 Film historian and music critic Geoff Brown will examine the joys and headaches of multi-lingual filming and cross-cultural exchange, with the emphasis on Britain’s participation in Ufa’s output during the turbulent last months of the Weimar Republic, just before Hitler came to power in 1933. The technical problems, the culture clashes, the political ramifications, the drama of an elderly British character actor found on the pavement bleeding from his head: all will be revealed in a presentation combining film clips, images, and documentary evidence.